This simple proverb helped two of my friends last week.... "Is not wrong to make a wrong decision but it's very wrong not to make any decision." A business friend was having sleepless nights because his business was failing. He had spent a lot of money and effort on it. His pride refused to let him to discontinue or close the operation. He thought by some connections, he might make it again. However he could not make a decision, until when he had a chance to meet up with me. I advised him with the above statement. A 'yes' or a 'no' is a decision but by not making a decision is definitely wrong. Not making a decision would depress the mind. Next day, this friend called me on the phone. He said he could sleep very well last night because he had finally made a decision to close his entire business. He need not have to think about it any more. Another younger friend was facing another problem. He was living in anxiety because he darn not approach a girl he likes. He has known this girl for a couple of weeks through another good friend. He knows her phone number and yet was afraid to call her. He wanted to invite her for an outing, but was shy and afraid to date her. In silence he kept thinking over her. With encouragement I offered my simple proverb to this timid man. 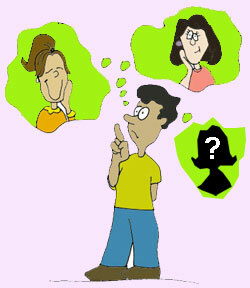 If you don't make a decision to call her, you won't know whether she likes you too. A week later, when I saw him again, I could see his face was smiling. Reason... He had finally decided to call the girl who didn't hesitate to accept his date willingly. So, the next time if you ever face any problems, please remember this quote.. "Is not wrong to make a wrong decision but it's very wrong not to make any decision." I'm glad you had decided to offer your nice comment here.